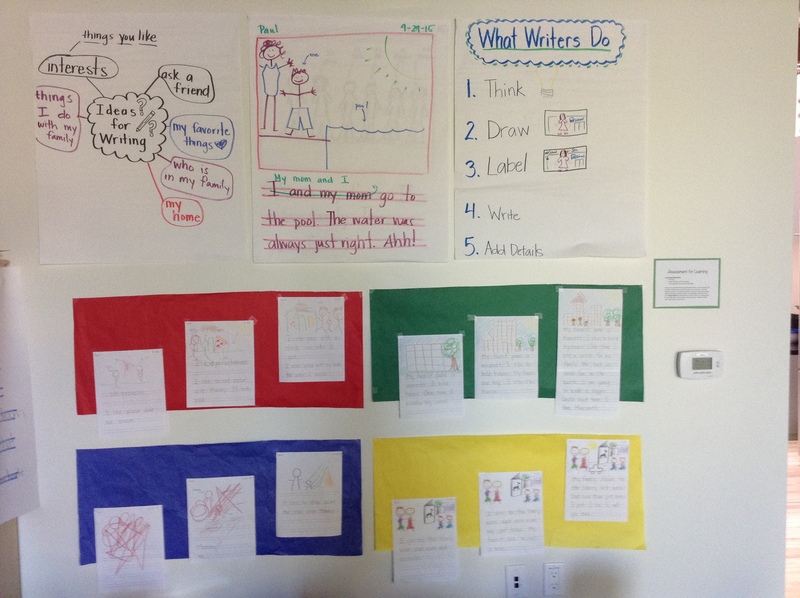 How can you go about helping little ones understand themselves as learners and as writers? Read on to find out how I’ve used visual success criteria with my little guys this year. Until this year, I’ve always taught older children. Fourth- and fifth-grade had always been my “wheelhouse,” and I had come to really love it. I loved that they could handle abstraction, think critically, and internalize their goals. I loved that I could show them rubrics, read through success criteria, and guide them through self-assessment and reflection. But this has become increasingly difficult over the past two years as I’ve begun working with younger children, especially this year with kindergarten and first-graders. I realized that I needed to change my approach for assessment for an entirely different stage of cognitive development–Piaget’s pre-operational stage–one characterized by egocentrism, a lack of psychological conservation, and a limited understanding of abstraction. The pre-operational stage, in particular, presents significant but not impossible challenges for individual goal-setting and reflection on learning. In the past, I relied on rubrics–worded success criteria–for this. But in this new environment, where the words on these pages would mean nothing to a slew of non-readers and concrete thinkers, I needed a different way to portray success criteria, a way to make learning paths visible, while still making room for students to choose their own paths, evaluate their work, and initiate improvements as a result. To meet all of these aforementioned needs, I created visual rubrics that had no actual words to convey success criteria. These rubrics did not “tell” students what to learn, but instead “showed” the success criteria within each of the examples. They looked up at me, unaware of what was going on and clearly confused, due to the fact that they had never done anything like this before. Nevertheless, I continued on. They turned and whispered to a buddy the names of the four colors–red, blue, green, and yellow. They were still confused, so I showed some examples. I requested a volunteer’s work, and asked the class to help me figure out what “type” of writer they were. Were blue, red, green or yellow? As a class, we helped my brave volunteer evaluate her work, and soon enough, we realized that she was currently red. She was working on putting spaces between her words and exploring spelling patterns. Up until this point, we had a bit of practice with this. Students took pictures of themselves, parts of the classroom, and even things they completed in class. And now, as part of their charge to document their work, they’d evaluate their work against our visual rubrics by taking pictures. Much to my surprise, this process was easier than I imagined. Many students matched their work to the appropriate color and could even share a rudimentary rationale. Students talked about “messy handwriting” or “lots of details,” while others talked about “scribble scrabble” versus “neat pictures.” It seemed that through these visual rubrics, I had found a way to help my students personalize their own writing experience–and without planning a different lesson for each of them. Instead, I gave them the tools to evaluate their own work, circulating and assisting throughout the process. This initial lesson served as the catalyst for the upcoming week of writing workshop. Students readily identified the successes of current writing samples and goals for future pieces using the rubrics. For some, they did this 2-3 times per week, helping them see that writing is a constantly reflective and iterative process, one that is never quite finished. I lit up with excitement, knowing that one of these young ones felt so empowered by initiating improvements to his own work, as opposed to being directed to improvements from high upon my teacher pedestal. 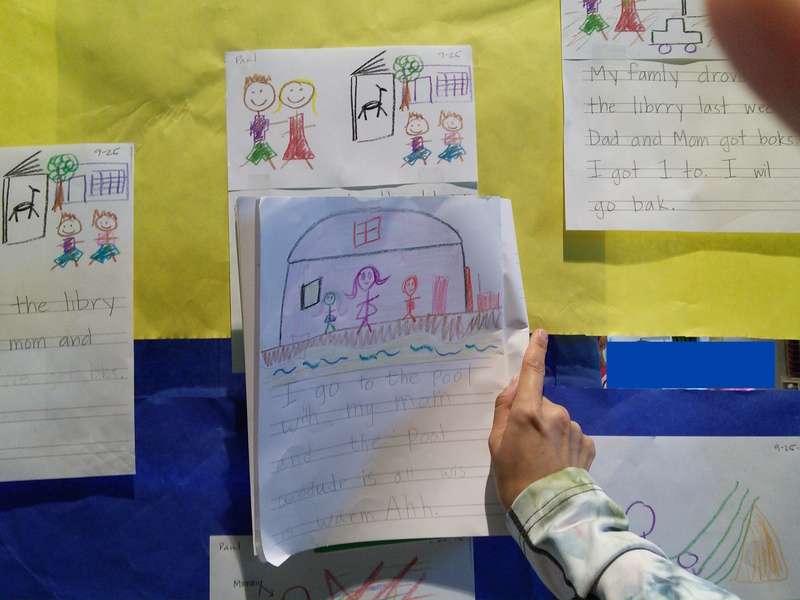 A student takes a picture of her work next to our rubrics (with the help of a teacher hand). Too often, we approach writing in one of two ways: whole-language or skills-based. Educators who are intent on applying skills-based techniques frequently distill lessons down into too granular of objectives. While students may learn mechanical skills for writing, they do so in an isolated and robotic manner. As a result, writing becomes a decontextualized chore–one that loses all meaning. On the other hand, some educators go the whole-language route, and in turn, run the risk of taking the rigor out of writing if they don’t provide focused feedback and time for conferring. This creates an environment where students never learn to notice their successes, question their challenges, and initiative improvements to their work independently. However, this past month or so, by using visual rubrics, I was able to achieve a healthy mix of these two seemingly opposing paradigms. I did not distill writing into decontextualized minilessons, nor did I rob these children of the rigor they so deserve. Instead, I contextualized the experience, helping them access success criteria and core writing skills, meanwhile fostering an environment of reflective goal-setting, building the foundations for metacognition. But even more so than that, I operated off of the assumption that all children simply want to succeed, that they want to see themselves as writers, and that they care wholeheartedly about becoming the best version of themselves possible. I just had to “show” them the path, so that they could walk it by themselves.